duchess fare: Regis Philbin Leaving Live! 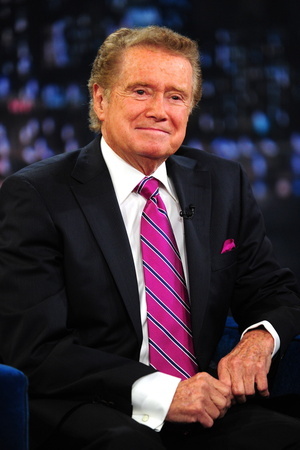 At 80 years of age, Regis Philbin has devoted his life to a successful career in radio and TV programming. Regis has been the co-host of the longtime running morning show Live! with Regis & Kelly. Tomorrow, 11/18, following the end of the program, Regis will be retiring from his post after 28 years. Live! is a show that I have seemed to have watched at various points throughout my life.... in the late 80s, (when Kathie Lee Gifford was co-host) watching when I was home sick from school, in the 90s, watching in college with my roommate before we left for our 9:30 class, and in the 2000s, when current co-host Kelly Ripa signed on. It sounds like tomorrow's show is aiming to be a loving and deserving tribute, with the audience packed with Regis' family and friends. For more, watch the attached video below to see Regis' iconic rise in the entertainment industry.